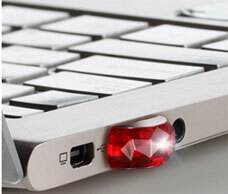 While it’s not one of those luxury USB flash drives encrusted with real gems that make you ooh and aah, ADATA’s Gem flash drive still manages to sparkle its way into attention. Officially named the DashDrive Durable UD310 USB Flash drive, the ADATA Gem drive is another super-mini flash drive with a very small form factor, making it the ideal companion for a user who packs light and is always on the go. 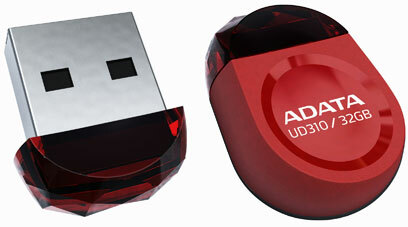 The ADATA Gem has been dubbed as such because its cap is designed to look like a gem, a ruby in particular. The company manufactured the flash drive using a unique process that makes it water- and impact-resistant. It’s also equipped with a special chip-on-board (COB) technology, which contributes to its durability as a drive. Having a small form factor and a rounded shape gives the USB and the port that it’s in some protection. Its size makes sure that you won’t accidentally bump into it while going about your business. And, its rounded shape ensures that clothing and other objects won’t snag. The ADATA Gem’s jeweled cap can be attached to the body when in use to prevent accidental loss. In terms of storage capacity, the flash drive offers some decent options, ranging from 8 GB to 32 GB. It also comes with a download of ADATA’s UDFtoGo software, which helps users manage data while on the road. The only drawback that the drive has is that it’s USB 2.0, so you won’t be getting the incredibly high transfer speeds that the SuperSpeed specifications of USB 3.0 offer. To make sure that consumers get the best out of the drive and to indicate quality production, ADATA has backed the USB with its lifetime warranty. If you want the sparkling little gem that ADATA is offering, it can be ordered online from a few well-known electronic outlets. The flash drive is available at Newegg.com, TigerDirect.com, and Amazon.com, to name a few. Grab the ADATA Gem flash drives at $7.99 for the 8 GB version, $12.99 for the 16 GB, and $21.99 for the 32 GB. This entry was posted in ADATA Technology and tagged ADATA, Chip on Board, flash drive, Gem, Jewel, Novelty Flash Drive, USB drive. Bookmark the permalink.